For most people, a ride in an ambulance isn’t a good thing. When Roseann Gunzelman took a trip in one to the hospital more than two decades ago, it was no exception. But at least there was a silver lining. Happy sailing for the last 23 years that is. Or maybe 24. She really can’t remember. Either way, she thoroughly enjoys all the work she does, all of which is done on a strictly volunteer basis for the Tabernacle Rescue Squad. Before her time at Tabernacle Rescue, Gunzelman was a hairdresser in Trenton, where she lived. When her family moved to Tabernacle, she tried to commute to Trenton, but the 45-plus-minute drive proved to be too difficult. Instead, she volunteered as a teacher assistant at the Tabernacle School District, which eventually led to a full-time job. She eventually would be laid off due to funding issues, which led her to take a job at the Berlin Township School District. Because of more financial issues, she ended up getting laid off again, and found herself back as an assistant at Tabernacle. Because of yet more financial issues, Gunzelman was laid off a third time, and this time ended up at the Shamong Township School District, where she was laid off a fourth time earlier this year from funding issues. However, being an EMT, Gunzelman has dealt with worse. Sometimes, she will have to respond to serious car accidents and other extremely graphic scenes. But she’s prepared. How does she handle those situations? Gunzelman notes therapists and resources are made available to the EMTs should their volunteer work take a toll on their mental well-being. But there is one other method of support, and that’s every EMT’s squad partner. At Tabernacle Rescue Squad, a squad partner will typically change on a day-to-day basis, depending on what shift one is working. The squad partner is the person one goes out on calls with. Gunzelman has three daughters, her oldest is Jessica — who is expecting a baby in January, which will be Gunzelman’s first grandchild — then Amanda and the youngest is Alexis. Alexis, who is also an EMT at Tabernacle Rescue Squad, was able to swing by The Sun’s interview of her mother. She called her mom “small but mighty,” and also cited her as the reason she became an EMT. “Her dedication and inspiration to this squad has encouraged people around her to give back to the community,” she said. 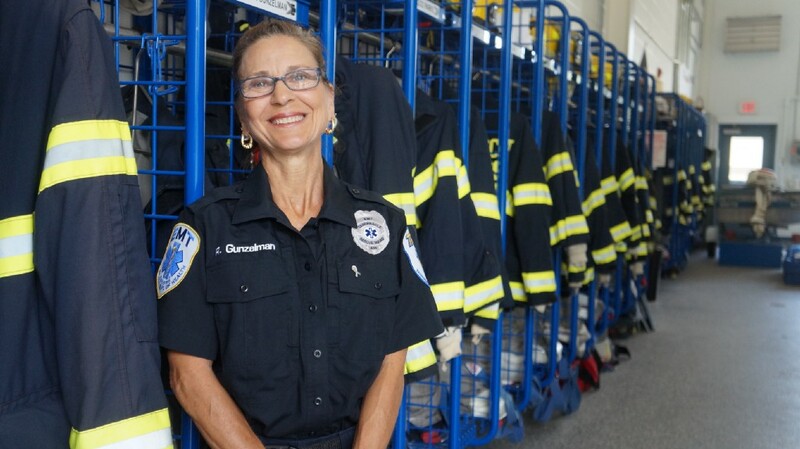 Gunzelman makes it clear she enjoys all the volunteer work she does on a personal level, but stresses the squad is as great as it is because of the teamwork of all the EMTs and everybody else involved.